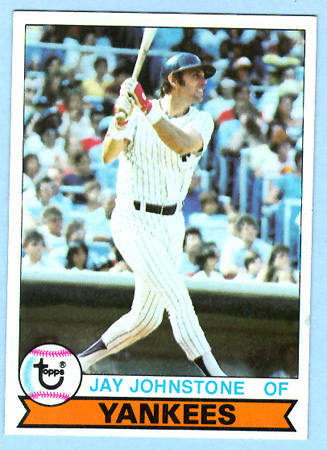 Jay Johnstone turned the role of a team’s fourth outfielder into a twenty-year big league career that included parts of the 1978 and ’79 seasons in pinstripes. Nicknamed “Moon Man” because he once claimed to have lost a fly ball he misjudged in the moonlight, the Manchester, CT native came to New York with outfielder Bobby Brown from the Phillies in a 1978 trade for reliever Rawley Eastwick. He played well enough for Manager Bob Lemon’s World Champions that year to make the Yankees’ World Series roster but when he got off to a slow start the following season, he was jettisoned to the Padres for someone named Dave Wehrmeister. Yankee fans’ most notable memory of Johnstone came while he was playing for the Dodgers during the 1981 Fall Classic, when his two run pinch-hit homer in the sixth inning of the fourth game against New York cut a three run Yankee lead to a single run, in a game LA eventually won to tie that Series at two games apiece. He was a genuine “Flake” who loved playing tricks on teammates. The Yankees were one of the eight teams he played for and he retired after the 1985 season with a .267 lifetime average and 1,267 career hits. Also born on this date is the second Manager in Yankee franchise history.